Thesis (M.A.) 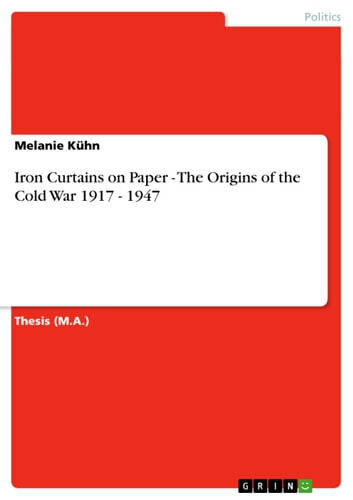 from the year 2009 in the subject Politics - International Politics - Region: USA, grade: 1,3, University of Leipzig (Institut für Amerikanistik), course: US Foreign Policy, language: English, abstract: (...)As a first step, this paper is to investigate different approaches historians have offered in the course of time. Chapter 2 starts off with a summary of the main waves of Cold War historiography (...) Chapters 3 to 7 are to study the most predominant perspectives and factors presented in chapter 2 in an attempt to show why some debates are very useful, some unnecessary, and some hardly solvable due to a lack of evidence. At the same time, this paper attempts to offer a good overview of main events shaping European and American history between 1917 and 1947. 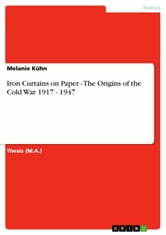 The third chapter is to explore the roots of the communist experiment in the Soviet Union (...) to find out in how far the two decades preceding the Cold War can add to understand its outcome. In 1941, relations between the U.S. and S.U. took a completely new shape when both decided to come together to fight Nazi-Germany and Japan. The Great Alliance set out to save the world from fascism (...). Chapter 4 will mainly focus on the conflicts that arose during the war to, again, find out in how far they shaped the onset of the Cold War. Although the emergence of the atomic bomb and diplomatic decisions surrounding it (in particular the fact that Russia was only informed about it in Potsdam) place it in one line with war-time conflicts outlined in the previous chapter, it seems to deserve an extra section, since the development of nuclear weapons ultimately changed the cause of warfare and thus, the course and outcome of the Cold War itself. Furthermore, the level of violence the nuclear attacks on Japan reached raises serious questions about the very necessity of employing such a weapon. The debate studied is polarized between those defending the use of the bombs and those blaming the Truman government (...) . Within two years after the war's ending, the great alliance quickly crumbled. Soon, hostility replaced cooperation and the old discrepancy between capitalism and communism regained predominance in contemporary rhetoric. Chapter 6 will not only outline the events leading to the breakdown of the alliance but also explore the questions whether there was the intention to keep the alliance alive at all and if so how this change of attitude came into being. Finally, the last part will investigate the first major political attack the United States launched against the Soviet Union - the Marshall Plan - which considerably impacted on the future distribution of power in Europe. Will The Real Albert Speer Please Stand Up?